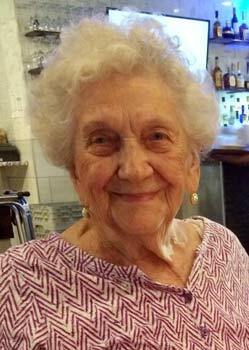 Lucille M. Dritlein, nee Scheffler, 99, of Norwood Park. Beloved wife of the late Leroy F. Dritlein. Loving mother of Dale Dritlein, Debra ( Ralph ) Bannach and the late Dennis (Ratree) Dritlein. Proud grandmother (Nanny) of Michael, Michele (Marlyn), Petcharat (Eric), Somchai, Daniel, Randy (Michelle), Denise (Jeremy) and Amanda (Eric). Great grandmother of 16; Great, great grandmother of Declan. Cherished friend of many. Lucille served as President of Immaculate Conception Seniors. She was a recipient of the Council of Catholic Women “Woman of the Year” award and the Parish Christifidelis Award. Visitation Sunday, August 19, 2018 at the M J Suerth Funeral Home, 6754 N. Northwest Hwy., Chicago from 2 until 8 pm. Funeral Monday prayers 9:30 am at funeral home to Immaculate Conception Church (Harlem and Talcott). Mass 10:00 am. Interment Maryhill Cemetery. Memorials appreciated to Rainbow Hospice, 1550 Bishop Court, Mount Prospect, IL. 60056. For further information 877-631-1240 or www.suerth.com.